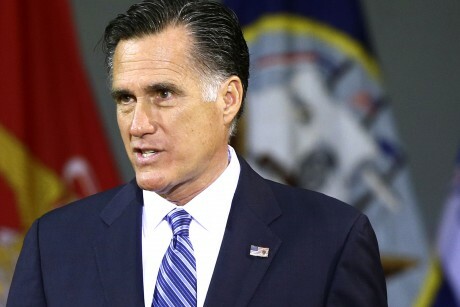 Newspaper Rock: Republicans lie about "apology tour"
Sorry, Mitt--Obama doesn't "apologize for America." But if he occasionally did, would that be so horrible? By David SirotaTruth-wise, “The Apology Tour” is about as factual as “Love Actually”—which is to say that, yes, there is a president of the United States, and this president does travel abroad and make speeches, but just like our president did not create a diplomatic crisis by leering at a British secretary, he did not travel abroad and give speeches apologizing for America. As CNN’s fact-checkers summarize, when Obama took the international trip in question in 2009, he “never uttered an apology for the United States.” This was previously confirmed by PolitiFact, which gave “The Apology Tour” its “Pants on Fire” rating, which is nothing short of the Academy Award for political lying. In short, you won’t see contrition, you will merely see a president do what Affleck did—merely acknowledge basic contextual facts that, whether we like it or not, define and shape our ongoing foreign and national security policy challenges. Because that is even more rare and taboo in politics than it is in Hollywood, Obama has been excoriated by a completely fictitious story that has absolutely no connection to reality. Considering its mendacity, why has “The Apology Tour” nonetheless metastasized into a talking point that is repeated so much that it has become unquestioned assumption? Because it taps into a virulent strain of jingoism that has been ascendant on the political right—a strain that got a public boost in the 1980s with Jeanne Kirkpatrick’s “Blame America First Crowd” speech and now categorizes any recitation of inconvenient historical facts or truisms as akin to “hating America.” Indeed, only a few years after George W. Bush rightly apologized for the atrocities at Abu Ghraib, the right’s “Apology Tour” catechism now effectively posits that the only way for a president to love America and build relationships in the world is for that president to never admit we’ve made mistakes and to use trips to foreign capitals as occasions to give the world a big Old-Glory-wrapped middle finger. But, then, was Bush harming America when he apologized for Abu Ghraib? Was President Ronald Reagan showing “weakness” and unpatriotically undermining the country when he apologized to Japan, France, China and Soviet-controlled Poland for various international episodes? Hardly. They were instead showing the world that an exceptional nation is one that is mature enough to recognize problems and mistakes and to, yes, pursue what Obama would call a “course correction.” They were also showing their comprehension of the most coldly calculating truism in statecraft: Preserving important relationships and/or opening the possibility of bilateral reconciliation often means copping to the mistakes we’ve made. By Kevin MattsonObama has ingested his Niebuhr, and it shows in various foreign policy areas. It animates the so-called “lead from behind” doctrine (a term an Obama adviser used in an interview with the New Yorker) and his continued faith that we must hold open discussions even with enemies like Iran. It animates his belief that America should not act alone in the world but build alliances—the sort of alliances his predecessor George W. Bush eschewed. The resultant view of American power is: Yes, America can stand for good abroad but must be cautious and act with a sense of humility. Obama has channeled his inner-Niebuhr ever since he made ending the Iraq War so central to his foreign policy. For Romney, any hint of concern that America might make mistakes, overextend itself or submit to virtually any constraint projects an image of weakness.And:I’m not sure if Romney has read Chambers the way Obama has read Niebuhr. But his blithe confidence—a near-religious faith—in America’s dominant role in the world certainly colors everything Romney stands for. He channels the Cold War conservative tradition of self-certainty and rollback when he calls for renewing enemy-status for Russia, sending more troops to Iraq, arming rebels in Syria, getting tougher on Iran (though how he could get any tougher than Obama has been on this one is unclear). And of course most of his top foreign policy advisers—and presumably, in a Romney administration, top appointees—are neocon blowhards like Dan Senor and (God help us) John Bolton. In an election where slipperiness on a range of issues is the hallmark of Romney’s candidacy, President Obama would have done voters a service by laying out his larger vision of America’s role in the world, and highlighting the deep gulf between his philosophy and Romney’s. The choice before us is too consequential to let such fundamental differences slip by without debate.Comment: As pundits have said, this debate is merely a continuation of the Manifest Destiny argument that's dominated America for 150-plus years. For more on the subject, see Obama vs. Romney on Manifest Destiny and Hitler Loved Manifest Destiny.